In the medium term I would expect DL to order more A330NEOs. OS and SN could also do with the A330NEO, as well as KA. I am sure many other carriers will at least look into the A330NEO. Once more A332s and A333s start reaching their retirement age, carriers will definitely consider replacing them with NEOs. Nope, it's an absolute certainty that DL will order more 339neos. I recall Richard Anderson saying that he got the 359s at $105K. Goodness knows what he got the 339s for. I think people expect way to many coming A330 orders. I think it is reasonable to assume that Airbus with the current order backlog, and with coming orders, will be able to maintain the A330 production at 5 to 6 aircraft per months for many years to come. It is unlikely that the A330 ever again will reach a production rate of 10 per month. With the 787 at 12 per month, and production possibly increase to 14 per month in a few years, the market ratio in this segment will be approximately 33 % Airbus and 67 % Boeing. If we look at orders in the last 10 years, the market share ratio between the A330 and 787 has been 50/50. This will clearly not be the case going forward. Note that the 777X and A330neo is in a similar situation. Both families have gone thru significant upgrades since first delivery, with significant MTOW increases. Boeing launched the 787, where the 787-8 is near identically sized as the A330-200-/800, and the 787-9 is near identically sized as the A330-300/-900. A few years later Airbus launched the A350, where the A350-900 and A350-1000 are near one to one replacements for the 777-200ER and 777-300ER respectively. Airbus responds to the 787 by upgrading the A330 family: New engines, increased wingspan, cabin upgrades etc. The A330neo is born. Boeing responds to the A350 by upgrading the 777 family: New engines, increased wingspan, cabin upgrades, a slight stretch etc. The 777X is born. I reckon these two warmed over families will continue to sell in similar numbers. Whether the A330neo (or 777X) is a success or not, depends on the price Airbus (Boeing) is able to achieve per aircraft sold. Ref. return on investments made. The 777X/A350 market share ratio will probably be similar to the A330/787 ratio, with the warmed over families having closer to 33 % market share, while the clean sheet families enjoying closer to 67 % market share (in their respective market segments). Thanks for your thoughts. I like your clean thinking that takes emotion out of the equation. You are sharing an educated opinion with some numbers to back your argument. Breath of fresh air! God, give us wings to fly! Farnborough will make or break the A330NEO. Well, fact of the matter is, whether leasing companies were sure of their ability to place A330neos or not when they ordered them years ago, the fact that many of these frames are still unplaced 3+ years later cannot be seen as a good thing for the neo's prospects either with operators or orders. Also most A330neo leasing orders were in fact placed without any idea who they would be leased too. CIT, Avolon, and ALC all committed to the A330neo at program launch at the Farnborough Air Show in 2014. You think they already had customers lined up? BOC is the only leasor to order A330neos since then (for 2), which are probably already committed. The strength of the A330ceo meant the leasing gaints were comfortable placing speculative orders for the A330neo. But the Neo will have to survive based on its own merit, not the A330ceo’s past success. If it can’t then the leasors will just move on. They are not going to try to force the A330neo to have the same success as the A330ceo. This needs to be emphasized that leasing companies places speculative orders. For a leasing company, a speculative order can be their most profitable order *if* the type is desirable. 1. Discount A330NEOs to keep contract commitments. If that happens, they will *not* place further orders except at discounts that meet their profit targets. 2. Differ A330NEO orders in hopes of finding future customers for unplaced frames. This keeps the leasing companies in competition with Airbus. 3. Pay penalties on an expensive lesson learned. This creates quite a bit of conflict between Airbus and the leasing companies as they of course want their money back. At this time, leasing companies are very hesitant to place speculative orders for any widebody except the A350 and 787. Because of the issues leasing companies are having issues moving the A330NEO, who thinks they will offer excellent terms on sale/leasebacks? That type of financing is incredibly common. It is what we would expect AirAsia to do. But leasing companies will only do sale/leasebacks on terms that attract investors. It is for Airbus to solve the issue. Boeing created it by discounting 787s after reducing production costs more than any of us predicted (at least I do not recall any posts from 3+ years ago predicting this level of competition). The game changed since A330NEO launch. What is the recovery plan? Farnborough will neither make nor break the A330neo. If Airbus will get a sizable order it is fine, if not the A330 production will go on. We know a few future lessors. We know about Rwandair taking 2. About TAP leasing additional frames to the ones they have ordered. ALC has placed 10 frames with Hy fly. Air Mauritius are getting 2 frames, again ALC. I think we will hear more when the frames are getting nearer to delivery. “Make or break” time for the A330neo is coming soon. If it doesn’t get more orders from solid customers soon then production will continue to fall and it will fall behind (or further behind) the 787 in costs and financial competitiveness...making it harder to win new orders and the cycle repeats. It becomes a death spiral that is difficult (albeit not impossible) to get out of and results in an aircraft that is trickling out of the production line like the 767 or 747. You can’t just assume that everything will be ok just because it is an A330. You yourself posted an article not too long ago about how Airbus hopes to raise production in ~2021 again after dropping it for 2019. That is going to require a steady increase in orders over the next year or so than what the Neo has currently been netting. Replacing leased aircraft is also a matter of costs. Assuming that a A330ceo operator will automatically replace their leased A330s with A330neos is about as sound as assuming that every 747 operator will replace their 747s with A380s. When it comes time to make decisions on next gen jets most are going to do their due dilligence and shop around and look at all their options. Leasing companies are only going to order and offer A330neos if it is financially attractive to them. If it isn’t, and for whatever reason the airline doesn’t or can’t afford to order direct from Airbus, then those airlines are going to have to start to turn towards 787s or A350s (or 797s, or A322 pluses, or whatever else might be available). The problem is that is only a short term benefit. Leasing companies are businesses, not charities. If they find that they are getting significantly better returns of investment from 787s than A330neos then they will just stop placing large speculative follow up orders for the A330neo in favor of the 787, and a supply of cheap leasable A330neos will no longer exist. If Airbus can’t replace those orders from leasing companies with direct orders than the total number of A330neos, and it’s re-marketability, will decrease, and the premiums to finance the plane will increase. Making it harder to be price competitive. The lack of orders may also require a production cut, further rising production costs and making it harder to be price competitive. It's a buyers market now and airframers can no longer force upon it what it can't bear. Airbus' expectation of their A330N's value does not align with the airlines' perception of it. That landmark sale to DL didn't help things much. Now everyone is eyeing a better deal than they would normally get. That is why Airbus/the leasing companies need to work hard to get more solid orders and commitments from blue chip customers, not airlines like Rwandair. The fact that leasing companies are having to lease out relatively early slots to airlines who business model is subleasing, wet leasing, and chartering out planes (HiFly), aka leasing from one middle man to another, is a little worrisome. Polot, you make some great points. KE, QF, VS, ANA, and BA have replaced 743s with 787s UA, DL, and soon IB and others (don't be upset if I have fewer A350 off the top of my head.. difficult morning). The same analogy applies 797 vs. A330ceo. Tokyo learned the hard way that lack of capacity just means bypass. To Devilfish, I couldn't agree more. Airbus must recognize the buyer's market and cater. It is a death spiral otherwise. By the time the A330CEOs come off lease, the A330 could be the next 747, just not profitable enough. Why does Indigo need a large A330NEO order ? 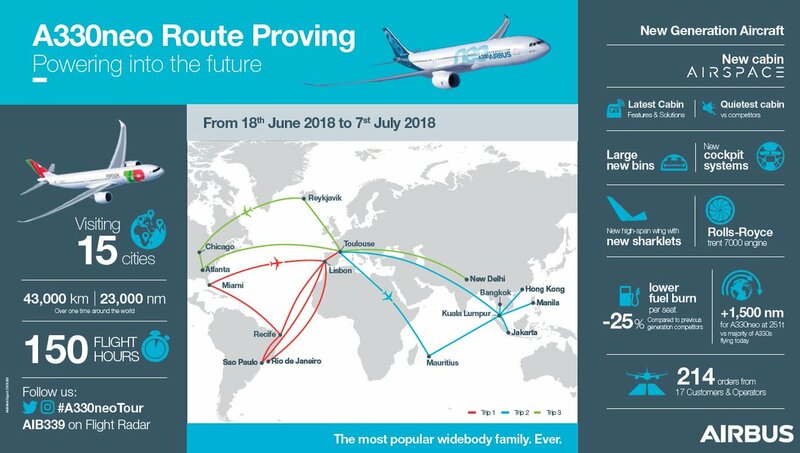 All of Asia is covered in A320NEO range, in fact if I remember correctly, the A330CEO still is more efficient <2500nm which is what most of Asia is for Indigo. If they want to venture into Europe, why don't they try with the A320NEO first and see if they get good load factors ? I'd think a low cost airline would prefer the narrow bodies for inaugural routes where possible. Indigo has intercontinental aspirations. An A320neo, especially in Indigo’s dense configuration, is not going to make it very far into Europe from India’s major cities. They currently need wide body range for that. Note the rumors are for up to 50 A330neos, I would expect that to include options. I don’t see them ordering 50 firm right off the bat. It's a good plane, if the A330ceo could hold up against the 787 the A330neo should certainly be able to do the same. But still the airlines decide to order 787s and A350s instead. The interesting part of this discussion is to find out why they make those choices against the A330neo. I don't know if it has been mentioned but the A330neo has the same range as the A350. The A338neo can reach 1,000 nm further than the 787. In essence, the A350 is competing with the A338neo. So if you are the Airline CEO, it boils down to profit per seat and operational cost. Forgive me but I have not looked at capacity from the A350 versus the A338neo, but if the operational costs are relatively the same but you can fit more passengers in the A350, then there is your answer right there. So in essence, this A338neo dilemma is not because of the 787 success, but rather to the A350 (I know I am about the get slaugthered here by Boeing fans). Look at the numbers and airline networks. Here is another point...if the A338neo has the same range and capacity of the A350, why would airlines order the 797? If the numbers of profitability per seat, and operational costs do not come in line...Delta and other airlines that are potential customers of the 797, will default to the 338neo. More range, good capacity. Thoughts? Huh? Airlines would order the 797 because it is a significantly lighter and cheaper airplane. If it is not, then it won't be launched because the business case would be awful. Regardless, I don't think DL (or anyone really) is going to default to the A338. I agree, Indigo should order 25 to 30 with options. That said, Boeing will compete. The A320NEO has about a 3,100nm still air range in a 186 seat configuration or 2,500nm or so range circle. . Recall the 3,700nm is for 162 seats with the ACT (cargo hold fuel tank that weights 3 tons full). Idigo uses exactly that 3 tons for 2.6 tons more payload and fittings (seats, O2). It is worth noting Indigo could try a lower risk strategy with the A321LR. Either way, they are Airbus' only hope of a large kickoff order to restart A330NEO sales that I know of. Boeing knows this too. Indigo must be getting a lot of airframer love right now. I agree. Both the A350 and the A330neo sit too high in the range chart. Good catch. Wait till Farnborough, an Asian airline may be ordering a few, not seen them mentioned here either. Thai ? They do have an ageing 772/773 fleet (6+6, on average 20 yrs old). They also have a dozen A333 so could share the crews. I’m sure there’s more than a few airlines that will be interested. It’d just be nice to see more momentum. Why did Airbus go ahead and build a plane that no one wants to buy? Has there ever been a rollout for a jet before where the airplane had zero orders? I fully expect more A330-900 orders. There is a market for low cost leases for widebodies, but who other than some rich head of state will buy the A330-800? As far as we know, AR picks would be between 787 and A350 to allow for growth; no more A330s of any kind. However the USD has gotten so freaking hot lately, I wouldn't be surprised if we did not see new orders until at least mid 2019. According to this thread, A330-900s were leased to Azul for $783,000 per month. If lessors are offering the plane for that price, there will be demand. Are the leasors making their normal profit or discounting to prevent a loss? DL customers are not fans of all the 767-300 and 767-400 being operated on so many longer flights. Spend an evening at JFK and just listen to the " oh not this old bird again" repeated throughout the gate areas. Delta is extremely active at getting feedback, and I have to think they are listening, especially to those of us flying over 50k per year. This being said, I can see DL placing a 50 firm/50 option order for A339NEO, and I think we will see some more firm A359 and 5 firm A35x as well. Positive reinforcement. It wouldn't do to have a model you were trying to sell continue to be pilloried in the specialist press without some forceful defense. Besides, it likely did not cost Airbus much to build as common parts ought to be readily available from the A339 test-campaign? The winglets look like the old prototype they initially showed and the whole frame presumably is mostly an empty shell (remember the 788 parade? - hyped to large orders tho.) Lastly, Airbus must've been confident about the A338's business case going forward and built it fully convinced they'd use it for certification. And unless I'm badly mistaken, wasn't HI's order still alive (admittedly in a coma) when Airbus rolled-out the glider in full house colors? There is a market for low cost leases for widebodies, but who other than some rich head of state will buy the A330-800? There might be a few odd airlines out there (who could not quite spring for the 787 for one reason or another) that need the A338's range and not the A339's capacity --- if the price is right. The A339s that were to have gone to Air Berlin are instead going to Rwandair to launch a KGL-JFK route, although they have a 242t A332 and a 242t A333; the A332 should have the range to reach JFK. As for these lessor orders; why are they not gunning hard for IndiGo with the incentive for earlier introduction? Airbus could also offer the ZB (collapsed) and IR (sanctions) slots to IndiGo as well. I expect DL to change some A359 orders to the A339 as 77E replacements, deferring their order to get 251t A339s. After all, DL really only needs the 77L for ATL-JNB, and for that, I could see a top-up 280t A359ULR order in a sub-300 seat configuration. Lufthansa (for Swiss) should be considering an order of 18-20 A339s as well. These would replace the A343s (which could go to Eurowings or Edelweiss as these frames are likely fully-owned) and the B77Ws (which would move to Lufthansa proper as B744 replacements in a 4-class configuration where they wouldn't be too much plane in Y - can Swiss really fill 270 seats in Y when that is more seats than their A343s had total? ), and these could use the A333 seat map of 236 seats, which makes more sense for LX). The B77W was likely ordered as nothing else had the range to replace the A343s at the time. Another entity to watch for is Thomas Cook, although they could take leased frames, as an option to replace their current wide-body stock (which is currently B763s, 230t A332/3s (fully owned), 233t A332s (dry-leased) and 238t A332s (damp-leased on the AirTanker AOC). B6 could be intriguing, but I can't see them needing more than 12-15 frames...likely destinations would be: LGW, ORY, BCN, MXP, EZE*, GRU* or VCP*, and TLV*, all based out of JFK. (* - needs 2 frames for daily service.) (For that, 10 frames would be needed for daily service.) None would be needed at FLL, as every destination to LatAm is within A321LR range even at 200 seats. That said, I suspect B6 would want to take frames that are leased with an option to buy after 12 years. On the Azul lease price, I have to wonder if the fact that HNA Group's partial ownership affected the lease price offered to Azul. Other airlines owned by HNA Group have frames owned by Avolon, a fellow HNA company now, but not when the leases were signed. Also, a plane was needed to fill the gap between the A350-900XWB and the A321neo. Had the 251t MTOW A338 been announced much earlier and the A350-800XWB, chances are that the A338 might have had actual sales. Also, I see the A338neo as the basis for a freighter sized between the B763 freighter and the A359 freighter when that comes, competing with an eventual B789 freighter. That actually doesn’t answer the question. The question is basically this. If we know that the leasing companies aren’t getting the same return as they would on a 787 why would they invest more capital in buying A339neo’s for about the same price upfront? I am talking about leasing ones not already on order this generating new orders from leasing companies. Sure, the bad bet they already made means that they will lease the ones they already have cheap to avoid not leasing them at all. But as a leasing company I am making an investment. If the 787 generates more revenue and has a higher residual why would I buy A330’s with my capital? It makes no sense. They could spike 787 supply even to the point the lease rates converge (they won’t but follow the point) and you still come out ahead because it has a higher residual value since there is a much bigger user base. So I agree there will be some supply of cheap A339neo since the leasing companies have already bought them. I also think you may see leasing companies trying to get out of a suboptimal investment. I also don’t see them buying more. It makes zero sense to invest money in something that will provide less return. DL currently has 56 763s and 21 764s, with 25 A339neos incoming earmarked as replacements. 50 firm + 50 option A339neo implies DL wants 75-125 A339neo in total, each of which are a very significant upguage from the 767s, even if this encompasses the current A330ceo replacements (none of which are very old), that's pushing it, especially for a carrier that exercises capacity disclipine to such an extent by still flying 767s TPAC. Actually Indigo is already working on its long haul plan. And have already approached DGCA for approvals to fly international. In India there is a heavy demand for western Europe and thats the market they intend to capture. I don,t think money is a challenge for 6E today. With the kind of scale of operation they are running in India. They can always order 50 odd A330 Neo,s and then do sale and lease back operation whenever the aircraft's are due for delivery. Also with the airport infra not catching up significantly with growth in the domestic aviation sector i can for see these widebody jets also deployed on metro routes like DEL-BOM/MAA/CCU/BLR. The question is basically this. If we know that the leasing companies aren’t getting the same return as they would on a 787 why would they invest more capital in buying A339neo’s for about the same price upfront? I am talking about leasing ones not already on order this generating new orders from leasing companies. Without knowledge of the actual purchase price, plus composition and amounts of front and end of lease payments, we do not 'know' what return the leasor is achieving. Had the 251t MTOW A338 been announced much earlier and the A350-800XWB, chances are that the A338 might have had actual sales. This reminds me of Newbiepilot's other point. I dunno...i have flogged the A338 on every thread here for VVIP transport...but there are no takers despite the plane's seeming fitness for the role. Was it preaching to the choir...a problem with the messenger...is Airbus actively promoting it as such? Is it over the top? Are the elite thumbing their noses at what could be perceived as a poor man's BBJ? Are their constituencies loathe to shoulder their upkeep...or are the exalted ones simply too cheap to pay for their own conveyances? Pressure is forming for A330 orders at Farnborough. Production to dip to 50/year in 2019. My take, unless there is significantly more uptake of the A330NEO, the sale /leaseback market will have poor terms. Terms that will force Indigo and AirAsia to divert cash from NEO purchases. Indigo learned their lesson with the ATRs. Last I looked they were having to pay cash for them as the financing options were poor. For a turboprop per month, Indigo can do that. If they stop buying occasional NEOs cash and stop upfront lease payments (for better terms), they could accept one or more A330NEO per quarter. Is it worth it? Sale/leaseback on the A350 or 787 is much healthier. We know they are worth their costs just from their backlogs. That's not pressure, not even artificial pressure, that's a paid PR article. Well Adam Levine-Weinberg's won't be caught bringing up serious doubts about Boeing. But I don't think he's paying for it. 787 sales were sluggish until Boeing unleashed their offensive. Would Airbus bite the bullet and do the same? When were 787 sales sluggish? from 2008 to 2017 ? I think Cathay Pacific will eventually make a decent order. Both for themselves and for Cathay Dragon. I think it's more likely that they will stick to the A350 though. It's already doing quite well for them. Good point on the A350 vs A330Neo. I was looking at these aircrafts specifications last week and was surprised to find the A350 sits between the 787\330 and 777x in size. It is a tweener plane that may offer benefits over the 330 and thus airlines are skipping the plane and going to the 350. And the competition from the 787 is also a problem. I do not think the 330 will compete with the 797. The 797 is supposed to be anything from a 757-300 to a 767-300ER. Totally different weight classes. But if an airline were debating between a 797 and the next step up. I think the 787 comes backs into play. The A300Neo is having a hard time of it right now vs the 787. KE have 29 A330-200/300 aircraft, some over 20 years old, that are mostly used for short and mid haul. They also manufacture parts for the 330. They are using their 787s on long haul only, perhaps they are an unmentioned possibility? That would have been wonderful for him, but I think you meant $105M. Wonder if it makes sense for them to spend time/money reducing cost of production like they are doing with the A320 family, or is it too late for that? Looking at the Yahoo link above, the idea that A is stashing aside orders for Farnborough lept off the page. They were making ceos at 5/month for most of the 2000s, and while they did get up to 10 for 2 -3 years earlier this decade, why does going back to that low rate mean so much cost wise for them?? Were they losing money a decade ago? Cutting costs and cutting rate at the same time is very difficult. Lower rate times may create an opportunity for more automation and robots, but creating a business case to justify the expense can be hard. It is also virtually impossible to get suppliers to cut costs when volume goes down. 787 production costs coming down and deferred costs dropping is happening at the same time rate is going up. There is a certain amount ot overhead that doesn’t change with production rate. Lower rates increase the share of overhead cost per plane. DIdn't Leeham quote Airbus as saying current production costs are $125M for the A350? The reality is the 787 production costs are *finally* under control. It is a super competitive market the A330NEO is entering. Boeing will bid at every airline. I do expect Airbus to win some competitions. But it cost Airbus about $5 billion to develop the A330NEO (ironically about the same cost as 748I). So they need to sell. Where did you get the 5 billion cost for developing the A330neo? AFAIK it is around 2 billion EUR.